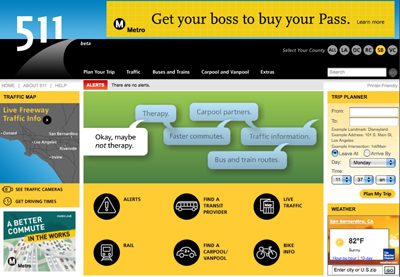 It’s hard not to notice the marketing blitz in recent months for go511, the five-county effort in So Cal to finally get a lot of important transportation information on one website and phone number. Go511 has everything from freeway traffic conditions to transit planning tools. The public transit features are tremendously helpful especially for transit commuters, newbies and veterans alike. A lot of people don’t take public transportation because the lack of information from how to get from one point to another. Hopefully, 511 will change that by arming commuters with the information they need to avoid traffic hot spots and make their commutes a little more pleasant. I’ve spent some time doodling with the go511 website and I think it’s definitely come a long ways since its test launch in late 2009. However, there is no mobile version of the site yet, although go511 officials tell me one is planned but not imminent. In the meantime, the current website has some features that use Flash, the animation software that doesn’t work on iPhones. We’re interested in your opinions on the g0511 service. Email us at sourcemetro@gmail.com.